From the Americas to Asia, the world is filled with beautiful beaches. Made up of nothing but sand and sea, these simple locations can mean so much and provide such huge amounts of joy to so many people. Whether you’re just looking to get away from it all and forget about the stresses of modern life or simply in need of a sunny spot to enjoy some sand and surf, the beach is always there. When planning summer vacations, many people like to choose destinations that have beautiful beaches, but a common problem with this is that many locations are simply becoming too popular to cope with all the crowds. Too much noise can ruin the relaxing atmosphere of a beach, so it can be a smart idea to seek out the lesser-known locations, with South American countries like Venezuela being key examples. Located on the on the northern coast of the continent, Venezuela has borders with Colombia, Guyana, Brazil, and Trinidad and Tobago, as well as having a long stretch of coastline looking out onto both the Caribbean Sea and Atlantic Ocean. The Venezuelan territory also includes many little islands and islets out in the Caribbean Sea, meaning that this nation has a huge number of terrific beaches just waiting to be explored. Venezuela has such a long list of gorgeous beaches, it would be simply impossible to list them all and you’d need a whole lifetime to appreciate each one. Therefore, in order to help narrow down your search and find the right beach for you, we’ve put together this Venezuela beach guide. Below, you’ll find key details and overviews of some of the best beaches in Venezuela, with useful information on the amenities and activities that can be enjoyed at each location. Madrisqui is found on the Isla El Gran Roque and is loaded with some of the softest white sands you'll ever see in your life. The sand here could almost be mistaken for sugar, it's so fine and powdery, and the waters are breathtaking too. The waves are very gentle here and the waters off the shore are shallow, providing just the right conditions for young children to splash around and making this one of the best family beaches in Venezuela. Fishing can be enjoyed on this beach as well, and it's not uncommon to spot angling enthusiasts casting out their lines to see what they can reel in. Another good thing about Madrisqui is that the local area has some good bars and eateries, so you can spend a full day here and never go hungry. 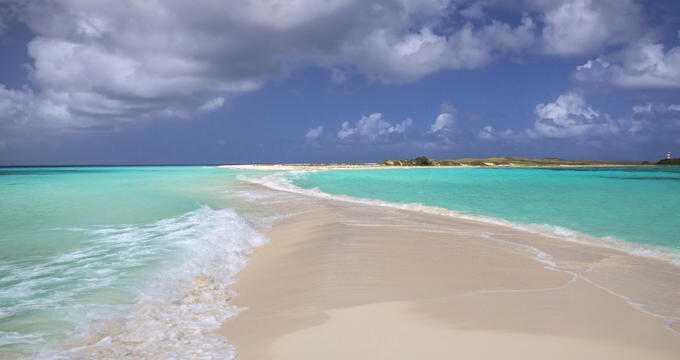 Located in the Los Roques National Park, Cayo de Agua provides a long slim stretch of soft white sand and really feels like your own private tropical island. It's a popular Venezuelan beach, but there's a lot of space here, so it never gets overly crowded or noisy, allowing visitors to simply lie down, relax, and listen to the gentle splash of the waves. Walking out along the sandbar can be fun too and is a great place to snap some photographs, but the tide can be unpredictable here so it's important to pay attention at all times. There aren't any toilets or amenities here though, so it's good for a few hours but not ideal for a full day. If you're looking for a good beach on the Venezuelan mainland, check out Mochima National Park. This preserved area is found on the northeastern coast and offers some truly world class, postcard-style views in every direction, with lots of forests, hills, and vegetation all around. Plenty of wildlife can be spotted here and there are several sandy spots to explore as well. Snorkeling, swimming, and even scuba diving can be enjoyed at Mochima National Park, and local companies run boat tours of the area and nearby islands. Over on Margarita Island, Playa El Yaque is one of the top touristic beaches in Venezuela and has a lot of great amenities to match up with its reputation. Lots of high quality hotels, eateries, shops, and private rental accommodation locations can be found around this beach, and it's an exceptionally popular spot for water sports in Venezuela. The likes of kitesurfing and windsurfing can be enjoyed here due to the big waves and strong winds, but it's a nice beach for rest and relaxation too. Crowds will gather here at busy times of year, but it's a big beach and there's more than enough room for everyone. If you happen to be staying in or near the stunning port city of Puerto la Cruz, Isla El Faro will be one of the most accessible beaches for you. This golden sand beach is nicely protected by the curved formation of the coastline, resulting in very calm, warm waters that are ideal for people of all ages to paddle, wade, and swim. Lots of little boats can be seen sitting just off the shore as well and there's a little dock to walk out on. The beach is fitted out with plenty of umbrellas and shady spots, with some good restaurants nearby too. The local area also features some scenic hiking and climbing trails, so there's a lot to do on this Venezuela beach.